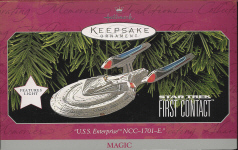 Hallmark Enteprise 1701 Refit Keepsake Ornament Coming for Christmas 2005! It's coming! Hallmark has scheduled the Star Trek U.S.S. 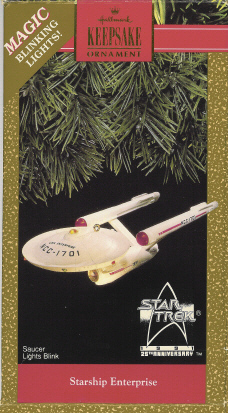 Enterprise Keepsake ship ornament for Christmas 2005. It's scheduled to be released late summer or early fall. Thanks to the entire Playtrek family and all Star Trek fans for making this dream come true. Hallmark, I guarantee you will not regret this! This is going to be a best seller. And I look forward to see what you have planned for 2006, Star Trek's 40th anniversary! For historical purposes, below is the original campaign to get this ornament made. Star Trek fans want an officially licensed Starship Enterprise 1701-A (as seen in the first six Star Trek films) Hallmark Keepsake Light-Up ornament. This site is designed to promote the idea, showing fan support in the hopes of convincing Hallmark for such an ornament in 2004. There is a distinct difference between the original series Enterprise model and the movie series refit Enterprise model. The refit Enterprise is sometimes called the 1701-A model because it received that designation in the fourth and most successful of Star Trek films. 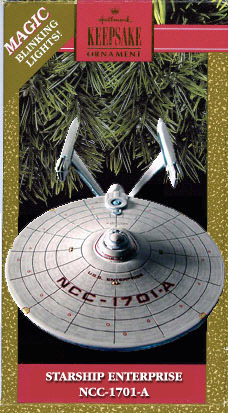 There is a large fan demand for a refit Enterprise 1701-A Hallmark Keepsake Light-Up ornament. 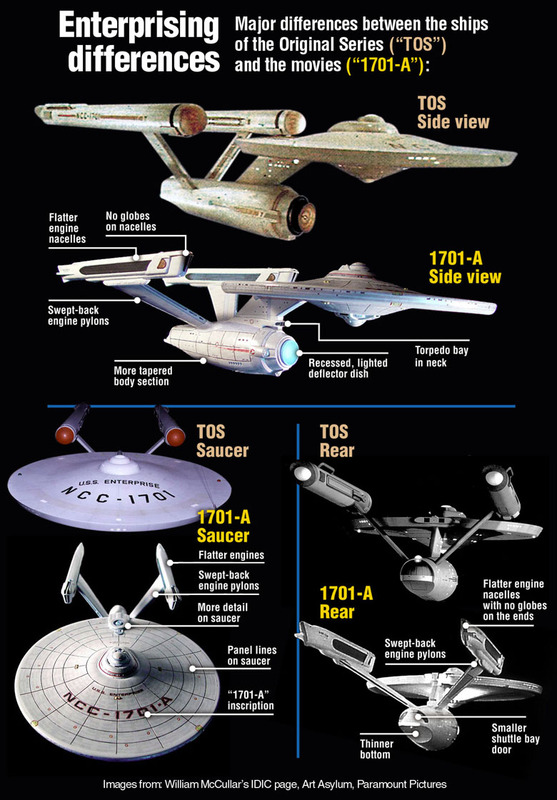 It is hoped that by establishing these two facts, Hallmark will be convinced to produce an Enterprise 1701-A ornament for 2004 or in the very near future. 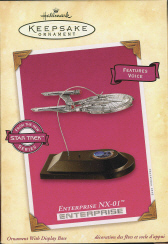 It is believed that Hallmark does not understand that there is a significant difference between the original TV Enterprise model and the film series Enterprise model Further, Hallmark mistakenly believes that they already produced that ornament in 1991, having it confused with the TV Enterprise design. Click on the image on the left to enlarge a graphic comparison of the two ships, highlighting their primary differences. Hallmark has not produced a movie era Enterprise. 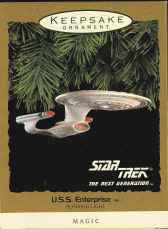 I should also remind the reader that the first Star Trek Enterprise ornament based upon the original 1960s TV series was produced in 1991 to celebrate the 25th anniversary of the TV show and is a extremely rare and highly sought ornament from Hallmark's line of Keepsake ornaments. This design is based upon the ship from Kirk and Spock's Star Trek, the most enduring of the Star Trek series television shows. Kirk and Spock's Star Trek continued with the successful movie series beginning in 1979, using the new refit Enterprise. In 2004, why not produce a Hallmark 1701-A refit Enterprise to celebrate the 25th anniversary of the Star Trek films that began in 1979? This distinct Enterprise will be a welcome addition to the Hallmark Keepsake ornament line of Star Trek ornaments. The group that needs the most convincing is the Hallmark retailers. Download the PDF version of this page by clicking HERE, print it and take it to your local retailers. The retailers need to be convinced as well that there is demand for this ornament. Spread the word. Let all Trek fans know about this site and send the message to Hallmark retailers, Hallmark headquarters, and Paramount that fans want a Star Trek 1701-A Enterprise ornament and that it would be a smash success at retail. A precedence has been set. Look at these Enterprise ships already made by Hallmark. Isn't it past time for a 1701-A Enterprise? FANS WANT THIS SHIP!!! This ship was only seen in 30 minutes of one Star Trek film. Although fans would probably like it, there are much more deserving ships to be made into ornaments. This ship was only seen in one hour of a Star Trek episode. Although fans would probably like it, there are much more deserving ships to be made into ornaments.